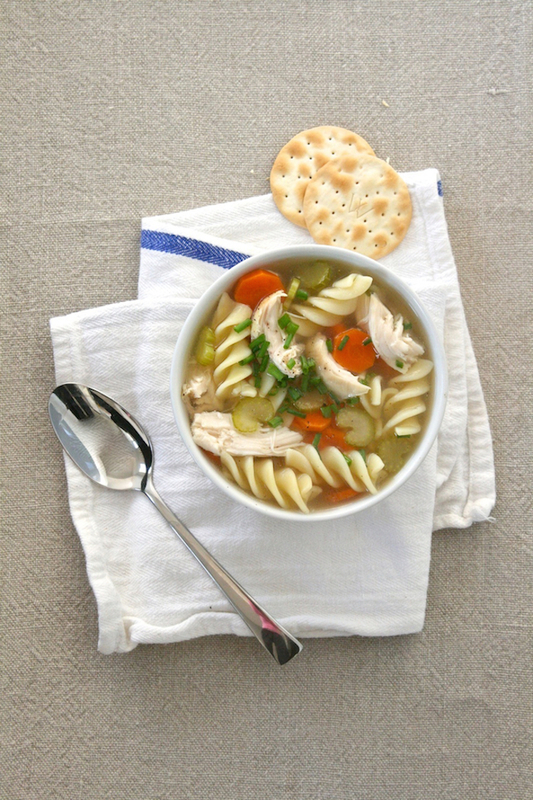 Easiest Ever Chicken Noodle Soup For One—My Latest On Refinery29! / Hey, EEP! Easiest Ever Chicken Noodle Soup For One—My Latest On Refinery29! This Chicken Noodle Soup is pretty special. Refinery29 asked me to come up with the easiest chicken soup recipe ever and here's what I did: Warm sliced carrots and celery in chicken broth, then stir in shredded rotisserie chicken, lemon juice and noodles for a quickie one-serving meal. You can even cook the noodles right in the broth if you're feeling extra-slothy (just add a little more water). 1. Bring the chicken broth, and 1/2 cup water to a simmer in a small saucepan over medium heat. Add the carrot and celery and simmer until slightly soft, about 5 minutes. 2. Stir the lemon juice, cooked noodles, shredded chicken, and a pinch each salt and pepper into the simmering broth. Ladle into a bowl. Top with snipped chives, if desired.